Ministers Gayantha Karunathillake and Rajitha Senaratne yesterday justified the purchase of more good vehicles for various Ministry’s saying that their work entailed a lot of travelling. 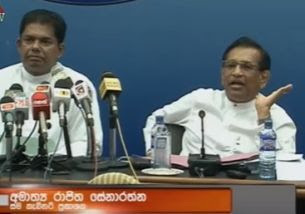 Responding to questions at the weekly Cabinet Press Briefing in Colombo, they claimed that there was a shortage of vehicles at government institutions and that was the reason for more funds being allocated to buy new cars.
" We, have a lot of work to do and travel to many remote areas.You need powerful engines to climb hilly terrain", they added. The Ministers said that all purchases were done in a proper manner devoid of commissions and with parliamentary approval.